The international tourism fair in Spain has begun on a good note. India has its own charm at the fair. Hola! The international tourism fair in Spain kicked off yesterday in the city of Madrid, which will run till January 24, 2016. Witnessing a huge footfall from different continents, Fitur is a meeting point for tourism professionals from different spheres like hotels, tour operators, tourism boards and airlines. Though Portugal, Poland, Philippines or Abu Dhabi are present at Fitur, but India has its own charm. The India Tourism Incredible India has enticed the visitors with the theme of yoga at Fitur. Ambassador of India in Spain along with the Queen of Spain inaugurated the India Pavilion. Roma Singh, regional director, Europe, UK and Israel and Pravir Chakravorty, assistant director, India tourism in Paris also graced the occasion. State tourism boards like Telangana, Andhra Pradesh, Kerala and Tamil Nadu are present here. Neerabh Kumar Prasad, principal secretary, Andhra Pradesh Tourism said, “The response is quite good. Fitur has given us an opportunity to promote Vishakapatnam for the Spanish tourists to India.” Har Sahay Meena, Commissioner of Tourism and Managing Director, Tamil Nadu Tourism Development Corporation said, “Tamil Nadu tourism has been taking various innovative incentives to attract large number of tourists from the world and Spain is one of the key markets for us. Fitur is the right platform to promote different potentials which Tamil Nadu tourism has.” In addition, a press meet has been conducted to inform Spanish media about the India tourism and the new areas coming up. The pavilion and state stalls are decorated beautifully with an Indian touch. Spanish girls in Indian attires are welcoming visitors with samosas, pakoras and laddos. The cultural performances are going on, which makes it unique. 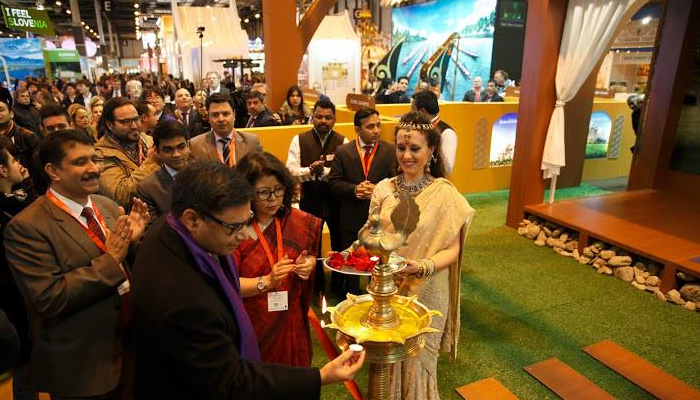 Though compared to WTM London or ITB Berlin, the participation of India is less at Fitur. However, the charm of India is very much there.